It's become a series: canning dates with girlfriends. We pile up boxes of canning jars on the table, handily dispatch hapless fruits into burbling pots on the stove, and spend all afternoon fogging up the windows in my kitchen. We did this last month for the first time, churning out seventeen jars of strawberry jam in the space of a day. Because you can never have too much strawberry jam. This time, with a team of newly minted canning enthusiasts, we tried something more ambitious: blueberry jam, and a double batch of the now-infamous peach salsa. By the stroke of twelve, we were hard at work. Karli shows off her tong technique. And in between, we snack, and wait. I love doing this. For one, it's good incentive to scrub off my Jackson Pollack of a stovetop and clean the kitchen. In canning season, I have the bad habit of letting the spilled jam, errant tomato peels and peach drippings build, and build... until the season is over and I can mop, knowing there will be no more jam on my floor until the following summer. This strategy worked well enough last year, until the day I set out for the stove, from the sink, and found my feet cemented in place by the build-up of gunk. I exaggerate, but only a little. This season, you will always be able to tell the color of my kitchen floor. And that's a good thing. Also, there's a menu to devise. Nothing fancy, just some things to munch on in between stirs of the jam-pot. Saturday, it was applesauce muffins, blackened green beans with onion dip, chips and salsa, and miniature clafloutis, to be blogged tomorrow. 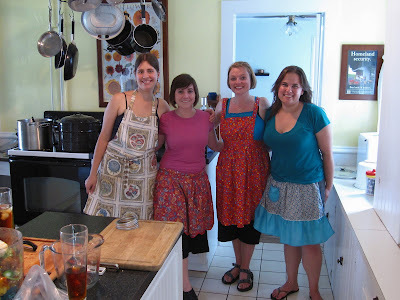 It's the simple pleasure of sharing a kitchen with friends that's the best. Canning is fun, but it's also work. Having the dramatic retelling of a love story (or a traumatic haircut experience) as the soundtrack for the day, we hardly noticed the work. The mountain of peaches before us vanished within minutes, the dishes were all washed, dried and put away without my notice. Many hands make light work. And in the end, we had eight jam jars, and eight pints of salsa to show for ourselves. And next month's session of homemade ketchup and bread-and-butter pickles to look forward to. Cuz it's gonna be ragin' outdoors. *Sigh* I love that chubby arm mushing the blueberries! I made zucchini bread on Sunday and slathered it with the blueberry jam from Saturday, and it was quite possibly perfection on a plate. You are making me so very hungry! I wish I was as ambitious as you! Everything looks and sounds so very yummy! those are fabulous photos!! i have such a fantastic yet EXHAUSTING time in your kitchen!! Exhausting in a good way, right? Ooh I love this idea! I've got to gather the girlfriends for our own canning party!! !